Today Teacher Gail planned a couple of things to help our kids get ready for Mothers Day. 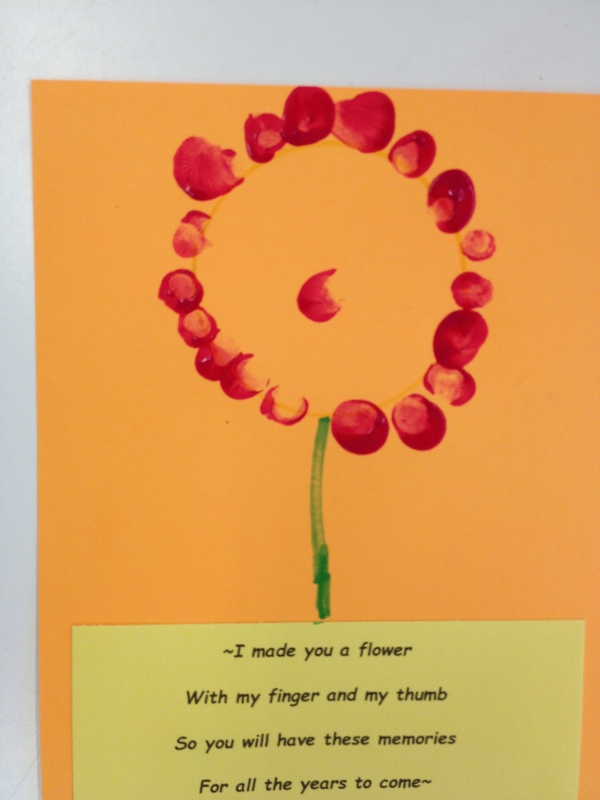 First, they made cards, forming flowers out of fingerprints. She was even able to coax my own son into doing it (he usually steers clear of the art projects, alas), which I appreciated! Then, after a mighty snack of enormous strawberries and crackers, we headed outside. The kids took turns planting flowers in cups–decorated with shiny stickers, always popular with the two-year-old set–for their mothers (and there were actually three grandmothers, plus a grandfather, in our class today! We love to meet everyone’s families.). It’s hard to believe the co-op is almost over for the year! Springtime is such a fun time of year to explore with our little guys.